The Grand View of Rome published by Giuseppe Vasi in 1765 was accompanied by two large etchings having the same height as the Grand View so that they could be placed next to it to complete the decoration of a wall. These two etchings were followed in 1771 by two others having the same dimensions. The choice of Campo Vaccino and of the Vatican as the subjects of the two 1765 etchings was consistent with the approach followed by Vasi in his ten books of etchings aimed at showing the magnificence of both ancient (Campo Vaccino) and modern (the Vatican) Rome. 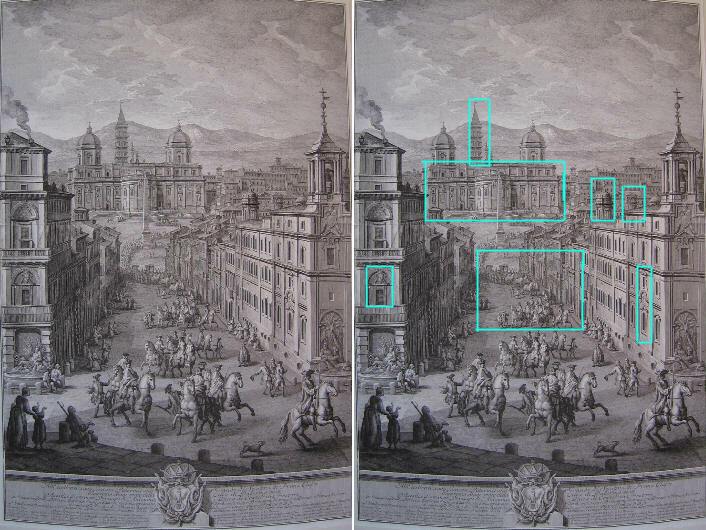 For the 1771 etchings Vasi chose areas of Rome which were not visible in detail in the Grand View of Rome. However the view of the tribune of S. Maria Maggiore was already shown in plate 122 (Book 7). The lower part of the etching contains a long dedication to Agesilao Bonanno, a Sicilian baron, who was very powerful in that part of the island where Vasi was born (Corleone, near Palermo). Supremo Magistrato della Città di Palermo etc. etc. D. Agesilao Bonanni Principe di S. Antonino e Duca di Castellana Pretore. Also the other 1771 etching was dedicated to Bonanni. Vasi placed between the etching and the dedication a short sentence he attributed to Titus Livius. Vasi was an architect, not a painter, and this is evident in the attention he paid to show the details of the buildings accurately. This accuracy allows easy identification of changes which occurred after 1771: Palazzo Albani was acquired by the Del Drago family and the coat of arms of Pope Clement XI Albani was replaced by a sacred image. The etching shows the lantern (the structure on the top of the dome) of S. Dionigi Areopagita, a lost church which was an interesting reminder of the XVIIth century competition between Spain and France. It belonged to the French Trinitarians, an order mainly devoted to freeing Christians captured by Muslims: the order had also a Spanish branch which in 1634 started to rebuild the small church and monastery they owned at le Quattro Fontane: by 1641 the two buildings (Chiesa e Monastero di S. Carlo) designed by Francesco Borromini were almost completed. The French Trinitarians felt they had to do the same and in 1635, most likely encouraged by Cardinal Jules Mazarin they started rebuilding their own church and monastery which were located next to the Spanish ones along Strada Felice, the street linking Trinità dei Monti with S. Maria Maggiore (today it is divided into three sections: Via Sistina, Via delle Quattro Fontane and Via Agostino De Pretis). The lantern was decorated with fleurs-de-lis, the heraldic symbol of France. In 1939 S. Dionigi Areopagita was demolished: some of the works of art which decorated it were relocated in other churches or at Villa Medici, which houses the French Academy in Rome. In his Grand View of Rome Vasi took liberties with physical laws and showed monuments which were not visible from his point of observation: in this etching however he was more faithful to the actual view. Vasi did not give details about the procession he showed in the etching: he had shown a similar procession in his 1756 etching (plate 122) and there again he did not make specific reference to it. The procession is unlikely to be linked to a religious ceremony, while it is possible that Vasi had in mind the visit paid by Charles VII, King of Naples to Pope Benedict XIV in 1744. (left) Building by M. Piacentini in Via Agostino de Pretis; (centre/right) a courtyard and an entrance of buildings in Via delle Quattro Fontane. The last section of Strada Felice next to S. Maria Maggiore (Via Agostino de Pretis) was entirely redesigned after 1870; only the façade of S. Paolo Primo Eremita was not pulled down. Via delle Quattro Fontane, the section of Strada Felice next to Quattro Fontane, retains most of the buildings shown by Vasi, although they now house hotels and offices rather than monasteries. The rear view of S. Maria Maggiore is perhaps more imposing than the front one. Its location at the top of the Esquilino hill, two large chapels built respectively by Pope Sixtus V (to the left) and Pope Paul V (to the right) and the obelisk placed by Pope Sixtus V, were all elements which led Gian Lorenzo Bernini to design an imposing rear façade: his project was based on the enlargement of the apse (which would have meant the loss of its mosaics) and on a double portico decorated with 47 statues. The project was commissioned by Pope Clement IX and work started in September 1669. The pope died just three months later and neither his heirs, nor the new pope (Pope Clement X) were prepared to move forward with such an expensive plan. Carlo Rainaldi was asked to prepare a simpler design and by 1673 the tribune as we see it today was completed: it was decorated with only four close to Heaven statues. All the area around S. Maria Maggiore was widely redesigned after 1870 and today the tribune and the obelisk are very near Via Cavour, a major street linking the central railway station with Colosseo. This led to slightly raising the level of the ground to the west of the obelisk, but overall the change did not impact on the view of the tribune. The comparison between a current image and Vasi's etching shows only one noticeable difference: the loss of Sixtus V's coat of arms, which was placed above the inscription to the left.